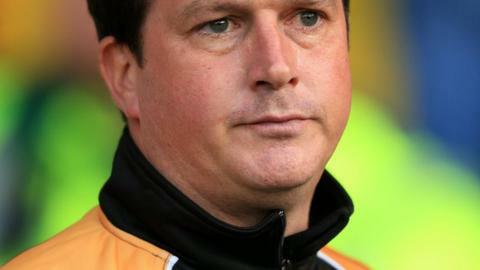 Former Mansfield and Torquay boss Paul Cox has become manager of Barrow on a three-and-a-half year deal following the departure of Darren Edmondson. Cox takes over from Edmondson, who left by mutual consent after Saturday's 3-1 National League defeat by Dover, and inherits a side in 16th place. The 43-year-old left Torquay in September after just three months. "His record spanning a number of leagues, chairmen and budgets is consistent," owner Paul Casson said. Cox led Mansfield back into the Football League with promotion from the Conference in 2012-13. He also led the Stags on an FA Cup run the following season where they lost narrowly to Liverpool at the third-round stage. Casson told BBC Radio Cumbria: "He wins at pretty much every level he's been at, he certainly won at this level before. "Paul has taken a team on a journey that we want to take and hopefully he can replicate that."